Belgium could become the first country in Europe to ban face coverings worn by observant Muslim women. (CNN) -- The latest round in the battle of the burqa kicks off Thursday in Belgium, which could become the first country in Europe to ban face coverings worn by observant Muslim women. Video: Should France ban burqas? "The majority of Muslims in Belgium and Europe don't accept the burqa, don't accept the niqab. It's only 10 percent who are radical," he says, blaming trends from Pakistan and Afghanistan for encouraging facial covering. And he rejects the suggestion that the proposed ban smacks of intolerance, saying it is the burqa -- and the Islamist movement -- that are truly intolerant and dangerous. He estimates that 300 to 400 women in the country wear the niqab or the burqa. Belgium is home to about 281,000 Muslims, the Pew Forum on Religion & Public Life estimates. That would make the country about 3 percent Muslim. Abdullah Bastin, a Muslim political leader in Belgium, warns that the legislation could have an effect exactly opposite from what it intends. Today only a few women wear the burqa, he says, but if the law is enacted, thousands will wear it as an angry reaction. He dismisses the idea that the law is designed to protect women's rights. This isn't protecting their dignity, it's colonialism, he argues. Jan Creemers, the mayor of the tiny picture-postcard city of Maaseik, says it was no problem to enforce the ban: "I had always the support of the Moroccan community here in Maaseik." "A general ban on the wearing of full face veils would violate the rights to freedom of expression and religion of those women who choose to express their identity or beliefs in this way," said Claudio Cordone, Amnesty International's interim secretary general. "Women must not be compelled to wear a headscarf or veil, either by the state or by individuals; and it is wrong for them to be prohibited by law from wearing it," Cordone said in a written statement. If the Chamber of Deputies approves the law, it will go to the upper house of the legislature for a vote. Belgium is not the only country considering banning the burqa. France said Tuesday that it would shortly be putting a similar draft law before Parliament. "Face-covering veils must be totally forbidden in the whole public space because women's dignity is not divisible," said Luc Chatel, a spokesman for the French government. "The second principle, of course, everything must be done so that no one feels stigmatized because of one's faith and religion. The president of the republic and the prime minister have asked the members of government to work hard on this point." He said the government will seek to avoid a partisan approach to the legislation, and will consult with all political groups "and of course, moral and religious authorities." A panel of French lawmakers recommended a ban in January. 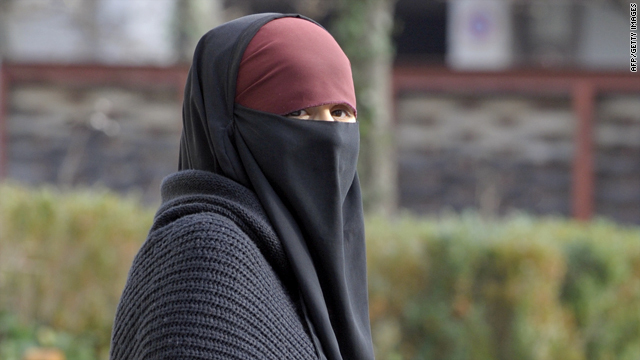 France denied citizenship to a man a week later because he made his wife wear a veil, and denied a woman citizenship in 2008 because she wore a burqa. The country's constitution fiercely guards the secularity of the state. Switzerland passed a ban on building minarets, the tall towers next to mosques, in a nationwide referendum in November. At the moment, Belgium has only "moderate" government restrictions on religion, a major Pew Forum study found last year. But Europe as a region is more restrictive than the Americas or sub-Saharan Africa, according to the study. CNN Senior International Correspondent Nic Robertson in Brussels, Belgium, contributed to this report.